(Nanowerk News) A Toledo, Ohio, physicist has implemented a new mathematical approach that accelerates some complex computer calculations used to simulate the formation of micro-thin materials ("First-passage time approach to kinetic Monte Carlo simulations of metal (100) growth"). Jacques Amar, Ph.D., professor of physics at the University of Toledo (UT), studies the modeling and growth of materials at the atomic level. He uses Ohio Supercomputer Center (OSC) resources and Kinetic Monte Carlo (KMC) methods to simulate the molecular beam epitaxy (MBE) process, where metals are heated until they transition into a gaseous state and then reform as thin films by condensing on a wafer in single-crystal thick layers. "One of the main advantages of MBE is the ability to control the deposition of thin films and atomic structures on the atomic scale in order to create nanostructures," explained Amar. Thin films are used in industry to create a variety of products, such as semiconductors, optical coatings, pharmaceuticals and solar cells. "Ohio's status as a worldwide manufacturing leader has led OSC to focus on the field of advanced materials as one of our areas of primary support," noted Ashok Krishnamurthy, co-interim co-executive director of the center. "As a result, numerous respected physicists, chemists and engineers, such as Dr. Amar, have accessed OSC computation and storage resources to advance their vital materials science research." Recently, Amar leveraged the center's powerful supercomputers to implement a "first-passage time approach" to speed up KMC simulations of the creation of materials just a few atoms thick. "The KMC method has been successfully used to carry out simulations of a wide variety of dynamical processes over experimentally relevant time and length scales," Amar noted. "However, in some cases, much of the simulation time can be 'wasted' on rapid, repetitive, low-barrier events." While a variety of approaches to dealing with the inefficiencies have been suggested, Amar settled on using a first-passage-time (FPT) approach to improve KMC processing speeds. FPT, sometimes also called first-hitting-time, is a statistical model that sets a certain threshold for a process and then estimates certain factors, such as the probability that the process reaches that threshold within a certain amount time or the mean time until which the threshold is reached. "In this approach, one avoids simulating the numerous diffusive hops of atoms, and instead replaces them with the first-passage time to make a transition from one location to another," Amar said. In particular, Amar and colleagues from the UT department of Physics and Astronomy targeted two atomic-level events for testing the FPT approach: edge-diffusion and corner rounding. Edge-diffusion involves the "hopping" movement of surface atoms – called adatoms – along the edges of islands, which are formed as the material is growing. Corner rounding involves the hopping of adatoms around island corners, leading to smoother islands. 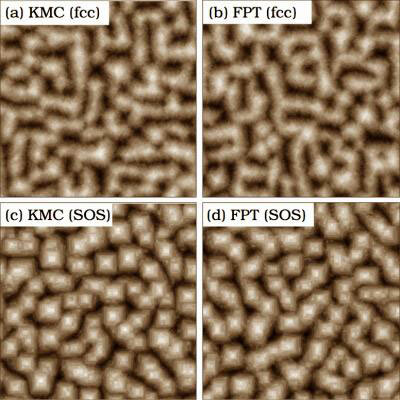 Amar compared the KMC-FPT and regular KMC simulation approaches using several different models of thin film growth: Cu/Cu(100), fcc(100) and solid-on-solid (SOS). Additionally, he employed two different methods for calculating the FPT for these events: the mean FPT (MFPT), as well as the full FPT distribution. "Both methods provided "very good agreement" between the FPT-KMC approach and regular KMC simulations," Amar concluded. "In addition, we find that our FPT approach can lead to a significant speed-up, compared to regular KMC simulations." Amar's FPT-KMC approach accelerated simulations by a factor of approximately 63 to 100 times faster than the corresponding KMC simulations for the fcc(100) model. The SOS model was improved by a factor of 36 to 76 times faster. For the Cu/Cu(100) tests, speed-up factors of 31 to 42 and 22 to 28 times faster were achieved, respectively, for simulations using the full FPT distribution and MFPT calculations.